A. C. Michael – The Guardian Originally published in The Illustrated London News, January 9, 1915. 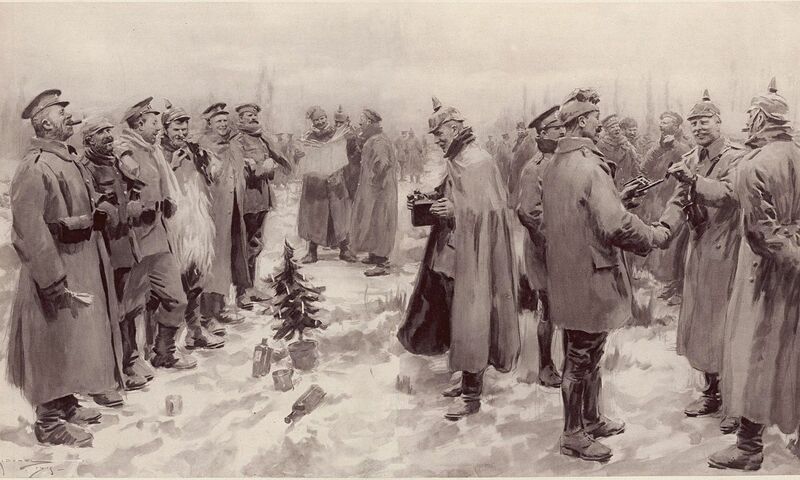 The Christmas truce (German: Weihnachtsfrieden; French: Trêve de Noël) was a series of widespread but unofficial ceasefires along the Western Front around Christmas 1914. In the week leading up to the holiday, German and British soldiers crossed trenches to exchange seasonal greetings and talk. Men from both sides ventured into no man’s land on Christmas Eve and Christmas Day to mingle and exchange food and souvenirs. There were joint burial ceremonies and prisoner swaps, while several meetings ended in carol-singing. Men played games of football with one another, giving one of the most enduring images of the truce. However, the peaceful behaviour was not ubiquitous; fighting continued in some sectors, while in others the sides settled on little more than arrangements to recover bodies. The following year, a few units arranged ceasefires, but the truces were not nearly as widespread as in 1914; this was, in part, due to strongly worded orders from the high commands of both sides prohibiting fraternisation. Soldiers were no longer amenable to truce by 1916. The war had become increasingly bitter after devastating human losses suffered during the battles of the Somme and Verdun, and the incorporation of poison gas. The truces were not unique to the Christmas period, and reflected a growing mood of “live and let live,” where infantry in close proximity would stop overtly aggressive behavior and often engage in small-scale fraternisation, engaging in conversation or bartering for cigarettes. In some sectors, there would be occasional ceasefires to allow soldiers to go between the lines and recover wounded or dead comrades, while in others, there would be a tacit agreement not to shoot while men rested, exercised, or worked in full view of the enemy. The Christmas truces were particularly significant due to the number of men involved and the level of their participation – even in very peaceful sectors, dozens of men openly congregating in daylight was remarkable – and are often seen as a symbolic moment of peace and humanity amidst one of the most violent events of human history. The first five months of World War I had seen an initial German attack through Belgium into France, which had been repulsed outside Paris by French and British troops at the Battle of the Marne in early September 1914. The Germans fell back to the Aisne valley, where they prepared defensive positions. In the subsequent Battle of the Aisne, the Allied forces were unable to push through the German line, and the fighting quickly degenerated into a stalemate; neither side was willing to give ground, and both started to develop fortified systems of trenches. To the north, on the right of the German army, there had been no defined front line, and both sides quickly began to try to use this gap to outflank one another; in the ensuing “Race to the Sea”, the two sides repeatedly clashed, each trying to push forward and threaten the end of the other’s line. After several months of fighting, during which the British forces were withdrawn from the Aisne and sent north into Flanders, the northern flank had developed into a similar stalemate. By November, there was a continuous front line running from the North Sea to the Swiss frontier, occupied on both sides by armies in prepared defensive positions. In the lead up to Christmas 1914, there were several peace initiatives. The Open Christmas Letter was a public message for peace addressed “To the Women of Germany and Austria”, signed by a group of 101 British women suffragettes at the end of 1914 as the first Christmas of World War I approached. Pope Benedict XV, on 7 December 1914, had begged for an official truce between the warring governments. He asked “that the guns may fall silent at least upon the night the angels sang.” This attempt was officially rebuffed. Roughly 100,000 British and German troops were involved in the unofficial cessations of hostility along the Western Front. The first truce started on Christmas Eve 1914, when German troops decorated the area around their trenches in the region of Ypres, Belgium and particularly in Saint-Yvon (called Saint-Yves, in Plugstreet/Ploegsteert – Comines-Warneton), where Capt. Bruce Bairnsfather described the truce. The Germans placed candles on their trenches and on Christmas trees, then continued the celebration by singing Christmas carols. The British responded by singing carols of their own. The two sides continued by shouting Christmas greetings to each other. Soon thereafter, there were excursions across No Man’s Land, where small gifts were exchanged, such as food, tobacco and alcohol, and souvenirs such as buttons and hats. The artillery in the region fell silent. The truce also allowed a breathing spell where recently killed soldiers could be brought back behind their lines by burial parties. Joint services were held. The fraternisation carried risks; some soldiers were shot by opposing forces. In many sectors, the truce lasted through Christmas night, continuing until New Year’s Day in others. On the day itself, Brigadier-General Walter Congreve, then commanding 18 Infantry Brigade, stationed near Neuve Chapelle, wrote a letter recalling the Germans initiated by calling a truce for the day. One of his brigade’s men bravely lifted his head above the parapet and others from both sides walked onto no man’s land. Officers and men shook hands and exchanged cigarettes and cigars, one of his Captains “smoked a cigar with the best shot in the German army,” the latter no more than 18 years old. Congreve admitted he was reluctant to personally witness the scene of the truce for fear he would be a prime target for German snipers. General Sir Horace Smith-Dorrien, commander of the British II Corps, issued orders forbidding friendly communication with the opposing German troops. Adolf Hitler, then a young corporal of the 16th Bavarian Reserve Infantry, was also an opponent of the truce. In the Comines sector of the front there was an early fraternisation between German and French soldiers in December 1914, during a short truce,and there are at least two other testimonials of similar behaviours in sectors where German and French companies opposed each other. In sections of the front where German and Belgian troops faced each other in December 1914, there was at least one such instance when a truce was achieved at the request of Belgian soldiers who wished to send letters back to their families, over the German-occupied territory of their own country. Richard Schirrmann, who was in a German regiment holding a position on the Bernhardstein, one of the mountains of the Vosges, wrote an account of events in December 1915: “When the Christmas bells sounded in the villages of the Vosges behind the lines ….. something fantastically unmilitary occurred. German and French troops spontaneously made peace and ceased hostilities; they visited each other through disused trench tunnels, and exchanged wine, cognac and cigarettes for Westphalian black bread, biscuits and ham. This suited them so well that they remained good friends even after Christmas was over.” He was separated from the French troops by a narrow No Man’s Land and described the landscape as: “Strewn with shattered trees, the ground ploughed up by shellfire, a wilderness of earth, tree-roots and tattered uniforms.” Military discipline was soon restored, but Schirrmann pondered over the incident, and whether “thoughtful young people of all countries could be provided with suitable meeting places where they could get to know each other.” He went on to found the German Youth Hostel Association in 1919. This entry was posted in British history, customs and tradiitons, Great Britain, war and tagged 1914, Christmas Truce, history, war, WWI. Bookmark the permalink.